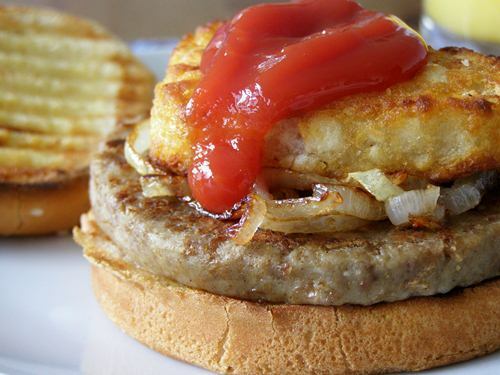 "Butter" grilled bun, Fry's burger patty top with slow fried onions, a hash-brown and ketchup. Ok, just an uncharacteristic non-recipe 'simple idea' post for you today. Mostly to prove I don't make semi-complicated meals all the time and enjoy some almost ready made food as much as the next person :-) This was, of course, delicious and I dare say would make a great hangover breakfast. Actually, I can confirm that. For the patty there I used a Fry's burger patty which works perfectly here. I absolutely love them but I don't think they taste like burger patties. To me they taste like a perfect sausage patty and therefore work really well here. 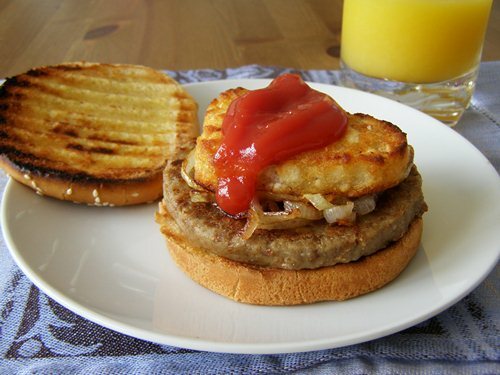 This was just whipped up one morning but if I really wanted to go for it I would make the English Muffins from Vegan Brunch and "butter" grill one of those for the ultimate Vegan Sausage McMuffin, screw the egg! Simply spread 'butter' on both sides of a bun or English Muffin and place on a grill pan toasting until nice and grilled. Press down on it while cooking to help get the lines, doens't matter if it gets squished as it's a pretty high burger in the end anyway! In a fry pan fry the onion nice and slow in the oil until very soft, golden and a bit crispy on some edges, remove. Now in the same pan fry the burger patty for 8 - 10 minutes until golden on both sides, add more oil if need be. Add the onion to the pan at the end to re-heat slightly. Now simply top the bun with the patty, onion, cooked hash-brown and lots of ketchup. Enjoy! Nutritional Information: approx, depending on bun used, how much ketchup etc.. I'm going to get the ingredients for & pop them in my freezer so that I can make this next time I'm hungover!